With bills, rent and food demanding a greater chunk of income, the Carlton Dry team has decided to ‘Shout a Share House’ and is offering the chance for five Aussie share houses to live in luxury for a year, rent-free and with the latest mod-cons. Five share houses (one in each mainland state) will have their rent and bills covered for an entire year, as well as win a number additional share house wish-list items: Foxtel, a cleaner, a Sonos wireless hi-fi system with unlimited streaming music, and a new bar fridge to chill their years’ supply of Carlton Dry. “Carlton Dry is all about enabling our drinkers to live for the moment,” said Andrew Meldrum, group marketing manager for Carlton Dry at CUB. “We’re giving five groups of Aussies the chance to live the dream rent free in luxury for a year. That cash injection, along with the beer, should help them have a pretty good 12-months, freeing up their funds so they can enjoy the fun things in life.”. The competition runs between the 1st October 2011 and 30th November 2011. 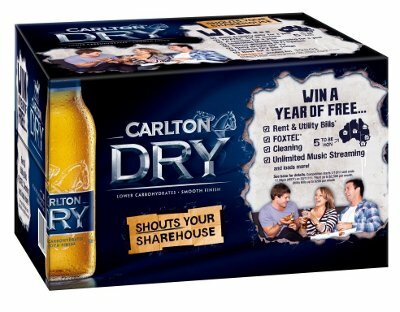 To enter simply enter the unique code found inside specially marked cartons of Carlton Dry or Carlton Dry Fusion, or on the game card you picked up at a participating venue with your bottle or glass of Carlton Dry or Carlton Dry Fusion at the Carlton Dry Website. For more information be sure to check out https://carltondry.com.au/sharehouse.